Banks was named the 2018 St. Lucia at the College's 78th annual Festival of St. Lucia on Thursday, December 6. 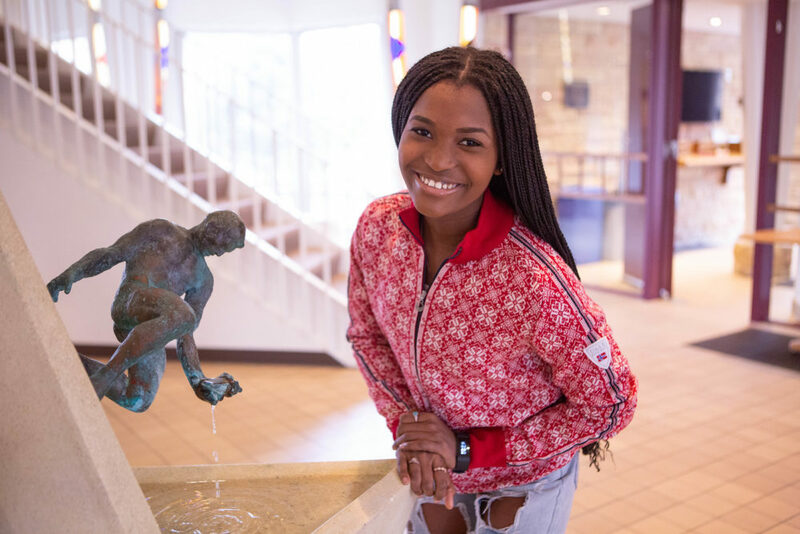 Sophomore Tyra Banks was selected as the 2018 St. Lucia. Gustavus Adolphus College sophomore Tyra Banks was crowned St. Lucia at the College’s 78th annual Festival of St. Lucia Celebration on Thursday, December 6. After being nominated along with five other sophomore women based on service to others, strength of character, courageous leadership, and compassion, Banks was selected as the 2018 honoree after a campus-wide vote. Banks grew up in Liberia and moved to the United States at the age of 13. A biology major and classics minor who conducts research with professor Joel Carlin on the genetic consequences of oil spills on marine life, Banks is also involved on campus as a member of the track and field team, Campus Activities Board, Pan-African Student Organization, mentoring program, and pre-health club. 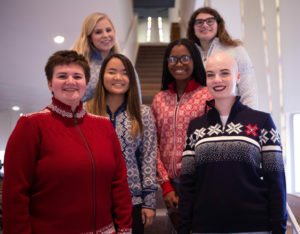 The day of celebration at Gustavus includes the St. Lucia court members singing carols throughout the College’s residence halls, breakfast with members of the Guild of Lucia, the annual chapel service in Christ Chapel, and a traditional Scandinavian smorgasbord luncheon sponsored by the Gustavus Library Associates. This year’s luncheon is highlighted by speaker Patrice Johnson, the author of Jul: Swedish American Holiday Traditions. The College’s celebration of the Swedish tradition began in 1941 and commemorates the courage shown by the legendary St. Lucia, who is known for her faith and service to others. In homes throughout Sweden, the eldest daughter plays the role of St. Lucia by preparing and serving baked goods and coffee to her family at sunrise. Lucia is a day celebrating community, light, and the end to long winter nights as a symbol of hope and peace for the Christmas season. The 2018 St. Lucia court included Banks, from Brooklyn Park, Minn.; Ellie Croonquist, from New Hope, Minn.; Holly Fitterer, from Sioux Falls, S.D. ; Signe Jeremiason, from Saint Peter, Minn.; Meg Nipe, from Burnsville, Minn.; and Kristie Olson, from Edina, Minn. So wonderful to see the St Lucia court! Kristie Olson is my next door neighbor!! Congratulations to ALL!